In this lesson, we will learn how to use a stem-and-leaf plot to organize data sets. Write the stems, in acsending order, of a stem-and-leaf plot for the following data set: 2, 29, 65, 31, and 93. The stem-and-leaf plot shows the ages of people at a birthday party. How many people attended the birthday party? 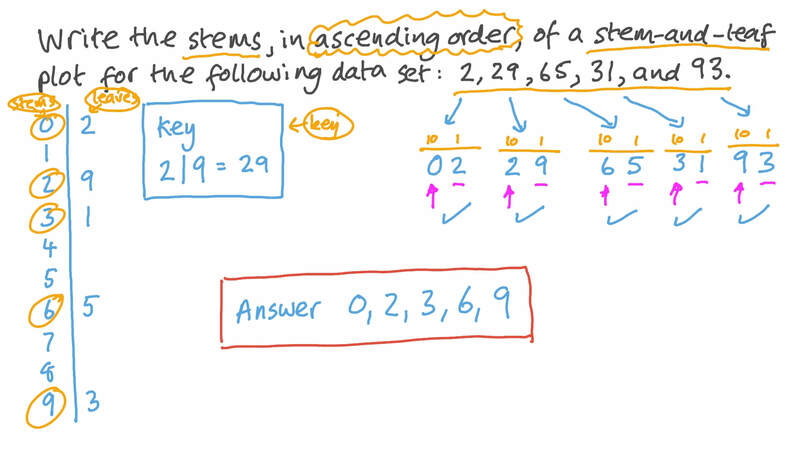 Write the stems, in acsending order, of a stem-and-leaf plot for the following data set: 11, 72, 38, 55, and 94. Write the stems, in acsending order, of a stem-and-leaf plot for the following data set: 67, 81, 74, 10, and 36. Write the stems, in acsending order, of a stem-and-leaf plot for the following data set: 70, 81, 22, 97, and 44.